Several readers have informed us and we have confirmed that Apple Store representatives are telling potential buyers of the company's new Mac Pro announced earlier this week that the updated models are set to become available for ordering on August 9th. Company sales representatives on both chat and telephone support systems have cited that date for the launch. While Apple will begin taking orders on August 9th, it is not yet confirmed that machines will actually begin shipping on that date. Representatives have claimed, however, that the August 9th date will be for actual orders and not for a pre-order program, suggesting that orders should begin shipping fairly soon after that date. 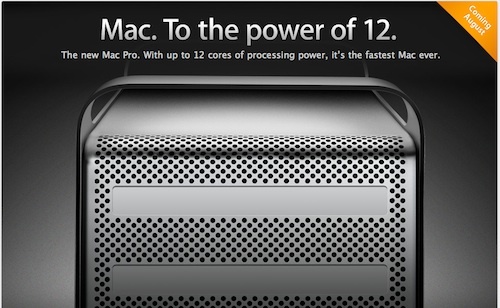 Apple's press release from earlier this week and the Mac Pro pages on its website simply state "August" as the availability date for the new Mac Pros, so it has been unclear at what point in the month customers could expect to begin placing their orders.